I led an 8 week Mastermind using Viktor Frankl’s, Man’s Search for Meaning, over 3 years ago. I can honestly say, not a week goes by that I do not recall some of the profound lessons that came from that study. I find the beginning of the New Year, an appropriate time to share a few of those lessons. Celebrations…specific ways I grew and improved and new accomplishments, areas in which I will continue to learn and move forward and new learning/methods/goals I will find a way to accomplish. What I will stop doing and what will replace that. This is my favorite time of year. I love pausing, reflecting, and setting up plans for the New Year. Along with my two column chart, I include the ways I made a difference in the world, whether it be one person at a time or larger groups. That to me is the most important celebration. While leading both individual and group coaching sessions, when asked, “What is your purpose in life?” the response is often “…to make a difference in people’s lives.” I do not stop there. I probe for them to go deeper. In what way will you make a difference? What will that look like? Will it be a specific profession? Will it be a role as a mother/ father/ grandparent? Will it be your core values you exhibit that will impact others by your example? What are those core values? Is this the basis for finding meaning in life? The paradoxical secret to finding meaning may be to not look for it. The most satisfying forms of meaning may emerge not when we pursue them directly, but when we instead seek encouraging others, love, justice, or, as Frankl writes, “a cause greater than oneself.” The secret to a meaningful life may be to remind ourselves every day to do the right thing, love fully, pursue risky experiences, and undertake important tasks, not because we are trying to increase our sense of meaning in life, but because these pursuits are good in themselves. Let me explain further. We are each born with unique skills, talents, traits. Each of these has been given in order to fulfill our purpose for being on Earth. Finding our own paths in which we are using what we have been given, in order to serve the world and others. This approach of doing what we do because it is the right thing, because it is what we believe, or it aligns with our core values, is a difference approach than searching for meaning. Pause, take 3-5 deep breaths. Let the logical thinking part of your brain, frontal cortex, catch up with the hijacked amygdala, the emotion center. Also, deep slow controlled breathing sends a message to the brain that calms and controls the nervous system. What is the right thing to do in the moment? Put it in perspective. It’s been said to ask yourself, “Will what is happening right now matter in 2, in 5, in 10 years?” Probably best to walk away. When there is a circumstance where someone you care about has hurt your feelings or done something that makes you mad, best to wait until emotion has subsided. However, very important that you let the person know how you felt. So often we hold our emotions in, never express them, and expect the other person to know, when nothing has been said. It is not fair to expect someone to read your mind when it hasn’t been expressed. Best to talk about it and clear the air. The same is true when in the work place, misunderstandings emerge. Best to talk about them instead of repressing thoughts and feeling. Be true to yourself. Know what is important to you and what a priority is for you. Is your time spent in alignment with what you say matters most to you? This is where actions speak louder than words. Walk the talk. 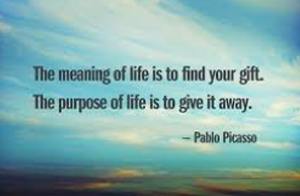 This is when the path you take is aligned with life giving back meaning. Consistently speak up and be able to say no if asked to do something that is not a priority for you. This goes the other way too. Is time with family a priority? Is health a priority? Is friendship a priority? If you find yourself saying, “I’m too busy at night to read to my kids.” Or “I don’t have time to go to the gym.” Or “I have to work late. I don’t have time to meet up with my friends.” What you are saying when you don’t make time, is it is not a priority! Be clear what matters most and be aware how much time you make for that. Viktor Frankl says that between stimulus and response, there is space. In that space is our power to choose our response. In that response lies our growth and our freedom. Frankl believed that within every circumstance, life is still expecting something: something in the present and something in the future. If we see life as something greater than our self, does it help to think, what is life expecting of me now? Is it to be angry, unforgiving, spiteful, jealous…all of those choices that do not serve others or our self? Or are we given circumstances in order to learn something, become stronger, or to be a model, an example as to how a higher power is more in control than my weaker human tendencies. As a Grandparent, I find a part of the purpose, the meaning I find in life, is being a beacon for those little new beings. What do I want them to see in my reaction when I am disrespected in front of them? Will they see unconditional love, no matter whether it is earned or not. Will they see me doing what is right, no matter what? Will they witness serving others for no expectation of gain? Will they see me as someone that listens and shows love with time? Living my life now as I want this chapter in my book of life to be written, is what gives my life meaning for me. I do not have to search. Meaning surrounds me in all I have to be grateful for. I need to live life as the best person, using, not wasting, my God given abilities. When I am finished with this life, I want to know that I lived life to the fullest, serving others, and becoming the very best I can become. I love the quote, “I want to die empty.” Also, Wayne Dyer says, “Do not die with the song still inside you.” These thoughts and intentions is what gives my life meaning. How about you?